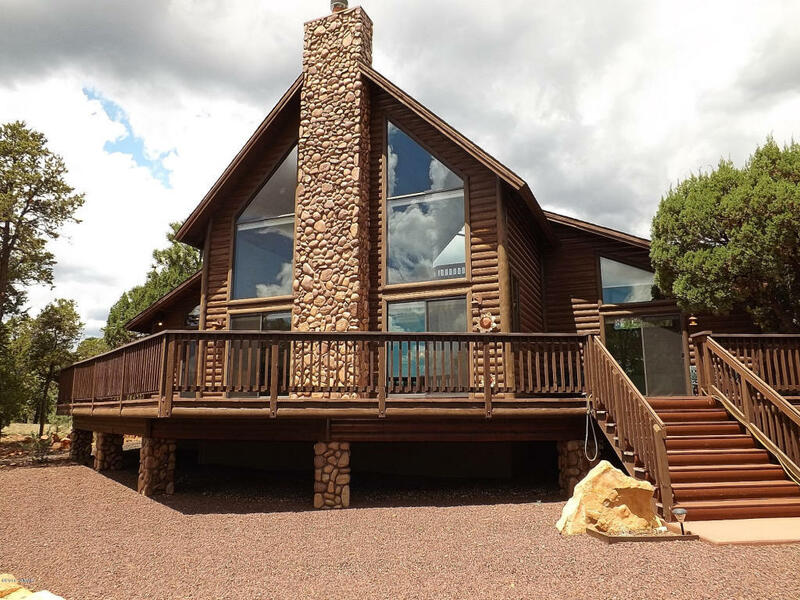 A magnificent High Country Pines II Chalet in the Rim Community of Heber AZ. This gorgeous split log sided cabin is framed by a beautifully treed .86 acre homesite on a quiet cul-de-sac and features a great room w/a wall of windows and a soaring floor to ceiling stone faced fireplace, large kitchen w/ an island, granite counter-tops and alder cabinetry, knotty pine T&G ceilings, exposed wood beams, 10' lodgepole support posts, surround sound, alder interior doors, an enormous loft also w/a wall of windows that can double as an extra sleeping area. The downstairs master suite has a private entry and exit as does the guest bedroom. The exterior boasts a covered rear deck, an extended length wrap around front deck, stone faced piers and chimney, a two car garage and is beautifully landscaped.